I finally did the one remaining Crossed Structure binding on the list. This is the CSB Hidden. 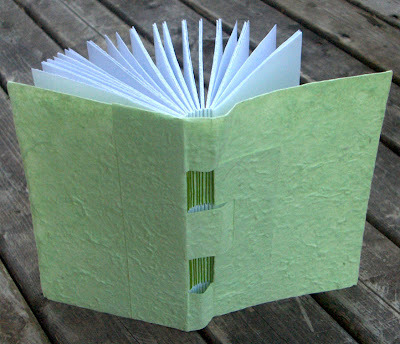 I have done two of these books now: one with a leather cover and one with a handmade paper cover. 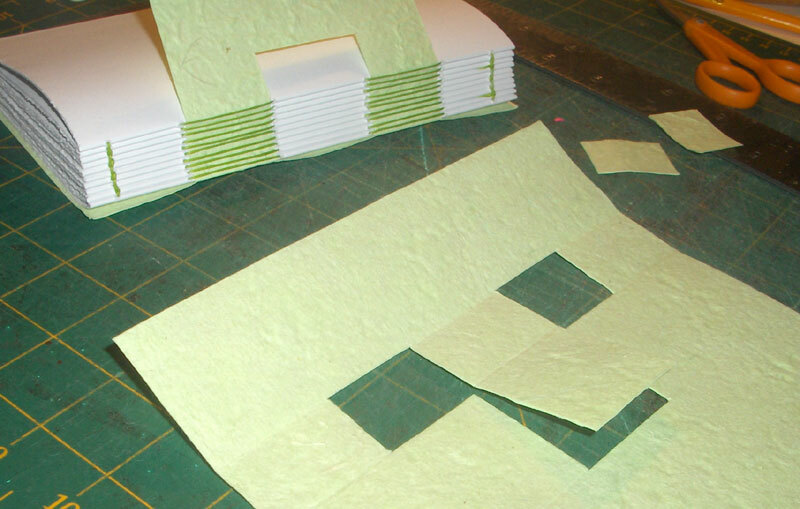 I found the paper cover worked better for me, probably since i was able to get more accurate folds and such. So the sections are sewn onto the D-shaped part of the back cover. The front cover is cut with an extension that folds over the spine and overlaps the back cover a bit. It has little windows for the sewing to show through and the D-panel on the back cover to poke through. The overlapping pieces on the front and back are then simply secured - I just pasted them into place. Cutting the front cover can be a bit tricky, requiring very accurate measurements for the various cuts. But overall, the process of making the CSB Hidden seemed simpler than some of the other CSBs. Here's the finished book, with the green apple handmade paper looking a bit better in the natural light outside...unlike the washed-out photos above. So I've worked my way though all of Arregui's CSBs. I am planning to revisit the CSB Solo since i think I'm not doing it quite right. But otherwise, let me see...I think the CSB Basic is my preferred style to make - I find it very flexible and can produce several different "looks" with that structure; however, the CSB Protective and CSB Linked are my new favorites so I want to do more with them now. Well, maybe not right NOW...but soon. I seem to have agreed to make several books for a local customer...24 books actually, to be ready by mid-December....so I'm kinda busy with that for now! I just happened upon your blog and am excited to read it. 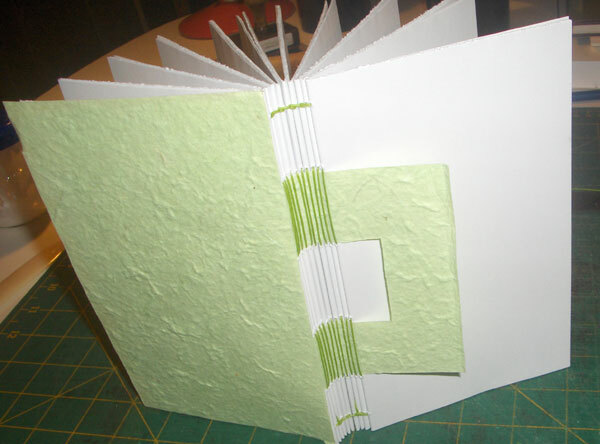 I have been very interested in book binding and am considering take a class next year. I have never done it before. thanks for sharing your talent. Hi Rhonda, this also is a very elegant structure. By looking at the pictures, I was wondering how you got the center strip from the one cover part through the "D" of the other cover part? I mean, there must be some cutting, mustn't it? Though I can't see any. A miracle? A trick? tulibri, yes, it is magic! 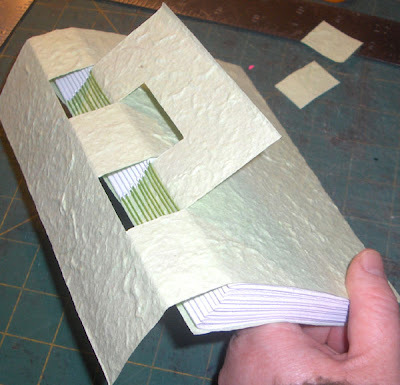 I just added another photo to this post - it shows the front cover before placing it on the book - and you can see the extra cuts to get those parts crossed.